Like politics, gardens makes strange bedfellows. Grass and burlap seem almost opposites: one living, one dead; one brown and rough, the other green and tender. Yet in yesteryear, gardeners layered burlap over grass seeds to help them grow, and it worked. As long as you select the appropriate burlap, you can do the same. 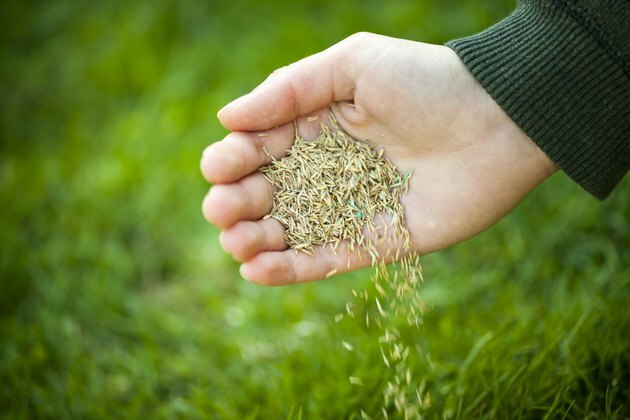 Even when grass seeds are planted carefully, they may wash away in rain. Rough to the touch but strong enough to make gunny sacks, burlap is no stranger in the garden. This rough-woven fabric is actually part plant, part wood; it is composed of the cellulose that is in plant stalks and of lignin, a polymeric substance in wood. Made of jute or hemp, burlap is used to make potato sacks, carpets and furniture. Gardeners use burlap to wrap tree roots when transplanting, to protect tender plants from winter damage, to impede weeds' progress and to prevent seed runoff when planting. Mulch is any material layered on top of the soil around plants to lock in humidity, keep down weeds and regulate the soil temperature. Gardeners use burlap as a kind of super mulch when planting grass. Like other mulch materials, such as straw, chopped leaves or compost, burlap helps the soil beneath it retain moisture and protects plants from excess sunlight and cold. Burlap, however, has additional benefits: It keeps birds from eating grass seeds and stops the seeds from washing away. Most people seed new lawns in fall or spring. Once the grass seeds are on the ground and well-irrigated, it's time for the burlap. Spread sheets of coarse, open-weave burlap over the newly planted lawn, and then stake the burlap sheets in place. The more wind you expect, the higher the number of stakes should be. Ensure your burlap is natural, not synthetic, so that you can leave it on the ground, allowing it to disintegrate. Grass grows up and through the holes in the fabric. Burlap is an especially effective mulch over grass seeds when the planted area is subject to soil erosion. Mature grass helps to prevent erosion. A layer of burlap over grass seeds also prevents the seeds from eroding before they mature. It can keep seeds on even the steepest grades. As the grass grows into the fabric, it anchors the burlap in place. In time, the burlap rots away, and its fibers become part of the soil.